On an appointed Sunday, Naomi invited her friends to her apartment to go through boxes of books and to take whatever we liked. Naomi was raised in a family that treasured books. She worked for many years as a book buyer and had accumulated many boxes of books. Over the course of the afternoon a steady stream of friends stopped by. Many of these books had a special place in Naomi’s heart and each was a gift of friendship. It seems that Naomi had far more books than her lovely, cozy apartment could make room for. For sometime the boxes had been stored in that uniquely American growth industry, a storage center. Naomi however is a soul who values both books and friends and it didn’t seem right to lock away what she no longer needed or had room for. So she entered upon a profoundly counter-cultural act, to give away most of her books. No storage locker, no garage sale, no eBay. She served wine and cheese and provided box upon box for our sorting pleasure. Often she would recommend a book to a particular friend making the gift even more special. I was reminded of the Native American potlatch. A potlatch is a gift giving ceremony and economic system practiced by indigenous Peoples of the Pacific Northwest coastline. The word comes from the Chinook language meaning to give away. To give something away simply for the pleasure of another is a wonderful experience. To give that which you value away for the well-being of the community is beautiful to behold. For the tribes of the Pacific Northwest the potlatch was based upon the core belief that the community was to be valued and honored. What better way than to gift what you hold most dear with those that you rely upon the most. The indigenous people believed that our true security rested not on what we accumulate but rather upon the support and caring of one’s fellow community members. The potlatch is based upon the belief that there is always enough to go around, that those with much will share with those who have less. The potlatch teaches that we all go through times of wealth and scarcity and what is constant is the support of the community. In our highly individualistic society Naomi’s book potlatch is radical stuff. Naomi is a generous soul by choice and by nature. A relative newcomer to McMinnville she has come to treasure the friendships she’s made and the ways she has been welcomed into people’s hearts. Her book potlatch was a reminder that we belong to one another. Thank you Naomi for the great books, particularly the one by Robert Coles that you recommended. Thank you for reminding us of the importance of community. Books? Yes! Free books? Oh yeah! 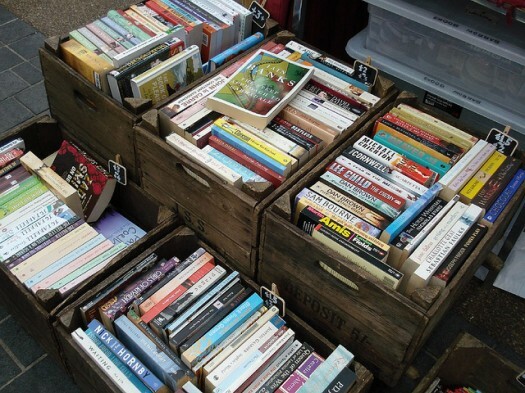 Free books in the interest of redemptive community? Priceless. Rob, your kind of potlatch! Yooooooooooooou betcha. Very nice, Kent. Ohhhhhhhh Rob, you would LOVE LOVE LOVE Naomi!!!!! She’s your kinda people! Barbara, your whole family is my kinda people! Stay cool (no, the other one). It was a beautiful time. I found myself sitting on the floor in between boxes of books, listening to the conversations swirling around the room between friends new and old. Books, memories and stories were shared. Thank you Naomi for your hospitality and for the (large) bag of books which I have adopted and they have come to live with my books!